Renyi Casting is a professional OEM manufacturer, established in 2005, specializing in the supply of die casting, lost wax casting, sand casting,precision machining and metal products. We supply raw casting to final finish product. We use tried and tested casting suppliers, but perform all secondary machining and QC operations in-house. Besides, we have both aluminum die casting and sand casting joint-venture foundries. Thanks to our experienced engineering team, skilled production operatives and strong relationship with key local sub-contractors, our company supplies a unique blend of manufacturing services to provide complete products to customers all over the world. 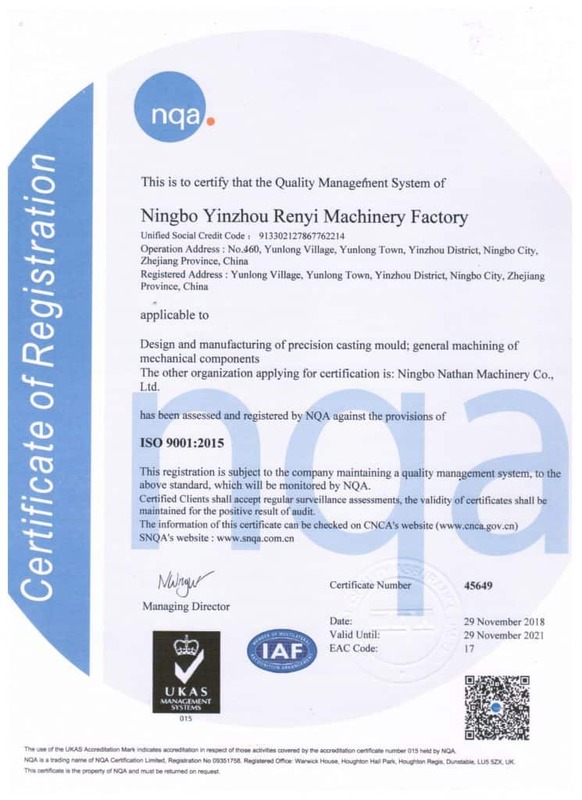 We are accredited to ISO 9001: 2015 quality management system through NQA, a UKAS recognized auditor. Our shop floor operate 5S methodology. Our key advantage over other is our attitude toward quality. We know what’s right, and not what just good enough. This is reflected in our quick response, technical analyze of drawings, proactive approach in passing on our production experience to help clients reduce cost and improve designs. All in all, we aim to supply competitively priced quality products, with the aim of creating a long lasting cooperation for mutual benefit. 4)Low Pressure Die Castings: Aluminum Low Pressure Die Castings. 5)Investment Castings(Precision Castings/Lost Wax Castings): Alloy Steel Investment Castings(Precision Castings), Carbon Steel Investment Castings(Precision Castings), Carbon Steel Lost Wax Castings, Stainless Steel Investment Castings(Precision Castings) Stainless Steel Lost Wax Castings. Ningbo Nathan Machinery Co., Ltd.